I love to eat seasonal and, when possible, local fruits and vegetables. August is one of those times when we see high temperatures and frequent trips to the outdoor grill to get out of the indoor kitchen heat. Barbecue chicken, steaks, ribs, hamburgers, and corn on the cob are your everyday grilling recipes but what about dessert? 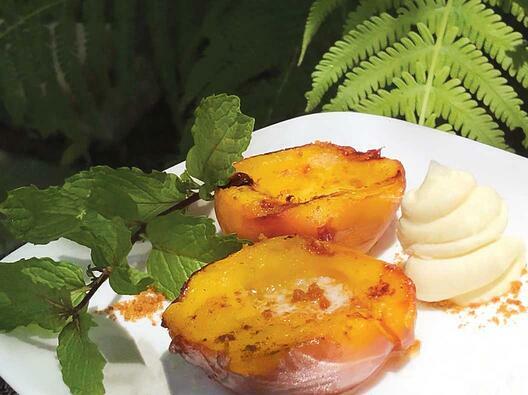 Wouldn’t it be fun to finish your meal right outside on your ElectriChef grill with a seasonal fruit dessert? 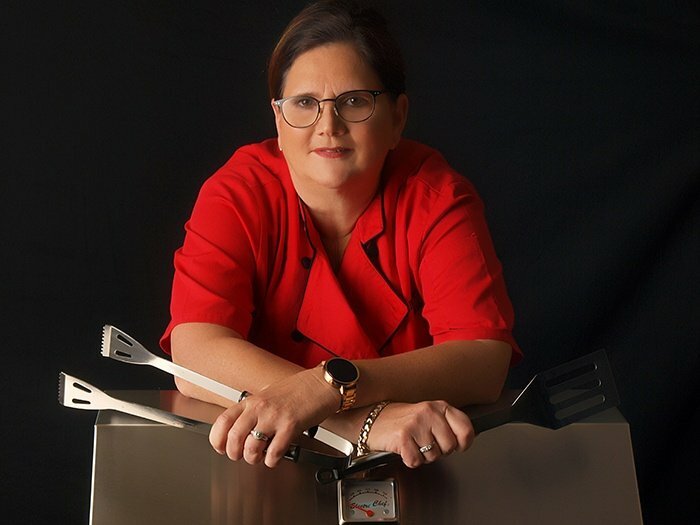 One of the many attributes of the ElectriChef grill is there is no transfer of any gas or charcoal flavor when grilling fruits and vegetables. Thus, if you were to grill fresh fruit on your electric grill, you would have a clean, fresh flavor palette rather than a transfer of a chemical taste associated with other types of grills (charcoal and gas). 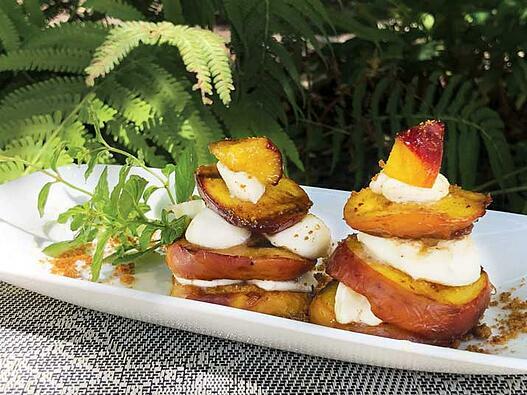 To highlight this electric grill quality, I would like to share a favorite August outdoor dessert recipe, Grilled Peaches with Mascarpone Cheese. This 15-minute summertime recipe is not only nutritious, but it has always been a delicious way for me to end a hot summer evening with a dessert everyone will love! If you have a pool full of children, substitute the mascarpone cheese with a scoop of vanilla ice cream, and you will be sure to have a crowd-pleasing response! NOTE: You have the option of grilling the peach halves or slicing the halves into three equal slices, creates a Napoleon effect with the mascarpone cheese in layers. I have photographed both methods and preferred to do the half peach with the mascarpone cheese on the side. 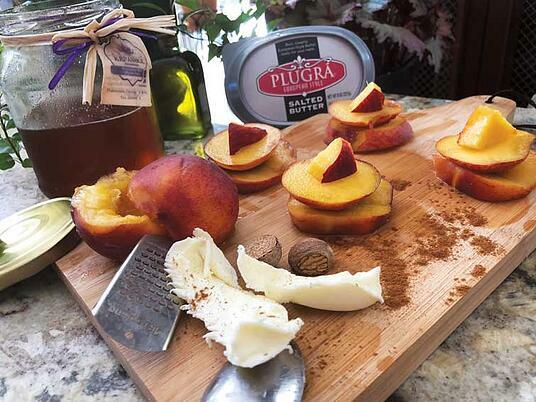 Place peach halves on a cutting board and baste each half with 1/2 the melted butter and sprinkle with cinnamon. Once the grill preheats, place peach halves skin side down on grill grate and close the lid. 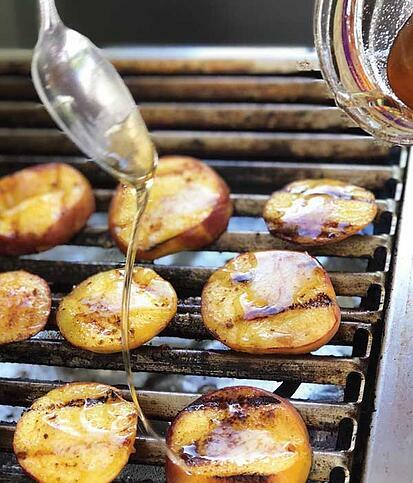 After 5-6 minutes open grill lid and baste top side of each peach half with butter and drizzle with 1/2 the maple syrup, turn each peach half. 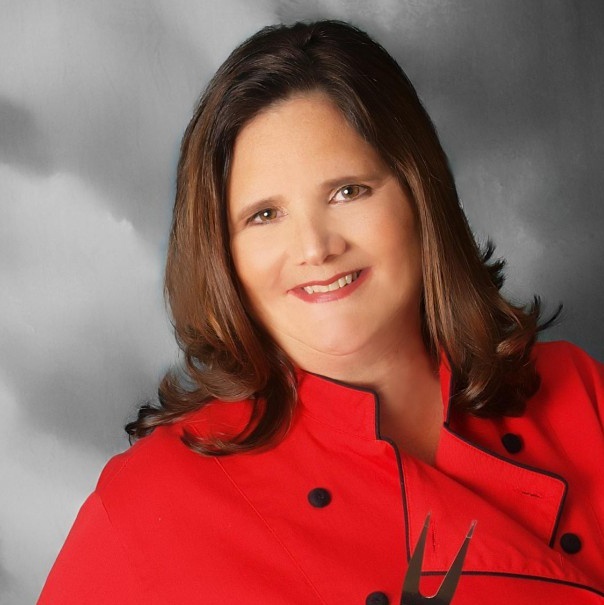 After 5-6 more minutes remove peaches from grill using tongs and place on a serving tray or individual plates. NOTE: You can serve a half peach or a whole peach per person depending on desired portion size. You also have the option of using a pastry bag to put mascarpone cheese in center of peach or on the side of the plate. Squeeze 1 ounce of cheese in the center of each peach half or 2 ounces on the side of a whole peach. Drizzle with remaining butter and maple syrup.